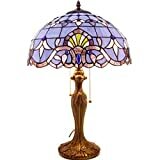 SERENITY, Tiffany-style Victorian table lamp is handcrafted with pure stained glass. Each glass piece individually positioned to create the perfect look and crystal gems to highlight the perfection. Exquisite touches create warmth and serenity. Expertly craft with top quality materials. 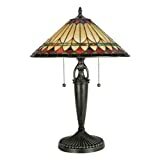 Dimensions Diameter 16 Inch Total height 24 Inch Materials Shade stained glass Base metal Glass pieces 270 Cabochons 27. Handmade Mosaic Glass Turkish Moroccan Table Night Lamp. Globe Diameter : 18cm (7").Height : 44cm (17.5").Antique Brass Color Engraved Metal Body.Handmade in Turkey. Made for US Use. US PLug & E12 US Socket. Needs E12 Bulb (Not Included). 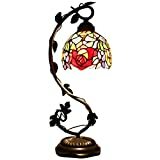 Bring the warm color tones of nature along with the free-flying spirit of a dragonfly into your home with this beautifully crafted Tiffany-style mini table lamp. 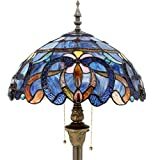 Constructed with more than 165 hand-cut glass pieces and 24 soldered jewels, this handcrafted piece uses the original artisan techniques developed by Louis Comfort Tiffany in the early 1900s. 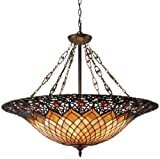 This lamp adds a warm and inviting glow when placed on a night table or used as an accent in a living room. Subtle illumination is produced by an incandescent bulb and the reflected colorful light that only the Tiffany style provides. 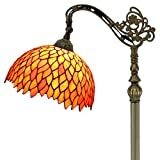 This lamp brings the warm color tones of nature into a decor Constructed with more than 165 hand-cut glass pieces and 24 soldered jewels Uses the original techniques developed by Louis Comfort Tiffany for a classic look 40-watt bulb incandescent bulb (not included) provides subtle illumination Shade height measures 6"" H UL listed for quality and safety Fixture measures 8"" Wide and 14.5"" tall Features a copper-foiled glass shade and aluminum base for a traditional look Main colors are : green, yellow, red Note: Shade colors will appear darker and less vibrant when not illuminated. WARNING: Attention California residents: This product contains lead, a chemical known to the State of California to cause cancer and birth defects or other reproductive harm. 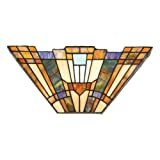 This stained glass product has been protected with mineral oil as part of the finishing process. Please use a soft dry cloth to remove any excess oil. 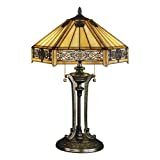 Products Size: Wide: 8 inch, Height: 21 inch Material: Lampshade: Stained Glass Lampbase: Resin Lampbase color: Bronze Antique. Packing Size: 59cm*22cm*31cm Details: UL certificated Max: 60Watt 110V Wire:1.7M Weight: 1.5KG More: Wide : 8 inch (20cm) Height : 21nch (51cm) Real Stained Glass lampshade Zinc lamp base with antiqure Bronze color Stock: E12 *1 bulb , Wire: 1.7 Meter, easy for move About Tiffany Lamp : Differnt from normal glass lamp, the tiffany lamp shade is made up of stained glass Cut glass: The craftsman should cut the big piece stained glass into thousands small pieces, and smooth all the edge of glass Copper foil: The craftsman bind the smallglass with copper foil, this can help the glass be weld with tin one by one Weld: The craftsman put the small glass into the model according the pattern, and weld the glass with tin surface treatment: Ater weld, the lampshade need to change the tin color into black with chemical. 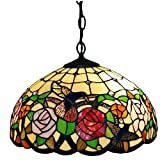 About Us: Tiffanyhouse is a manufacturer of tiffany lamp, we can accept specially inquire about size, color or other change, if any question , please contact with us.